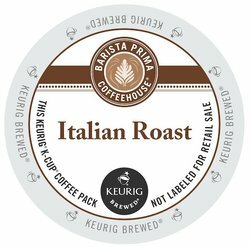 Barista Prima Coffee - Italian Roast K-Cups. A rich heavy-bodied cup with notes of ripe fruit and berry. The Italian Roast is a hearty and flavorful testament to the art of dark roasting. Each box contains 24 single serve K-Cups.